The solution is simple to Paste plain text from the clipboard via placeholder in QuickTextPaste at Ver. 2.66! And now, when you use the Hot-Key [Windows-Logo]+[V] QuickTextPaste will convert the formatted text to clear and plain text. And send paste command to active (foreground) window. (Image-1) Paste plain and clear unformatted text from the clipboard via placeholder! Each time that you copy something into the windows clipboard for example for pasting it into another application, the copied data is saved into multiple data formats not only in plain text, the paste plain text is a useful feature. QuickTextPaste - FAQ-8: How to Paste plain text from the clipboard via placeholder? What does restore the clipboard in QTP for Windows? 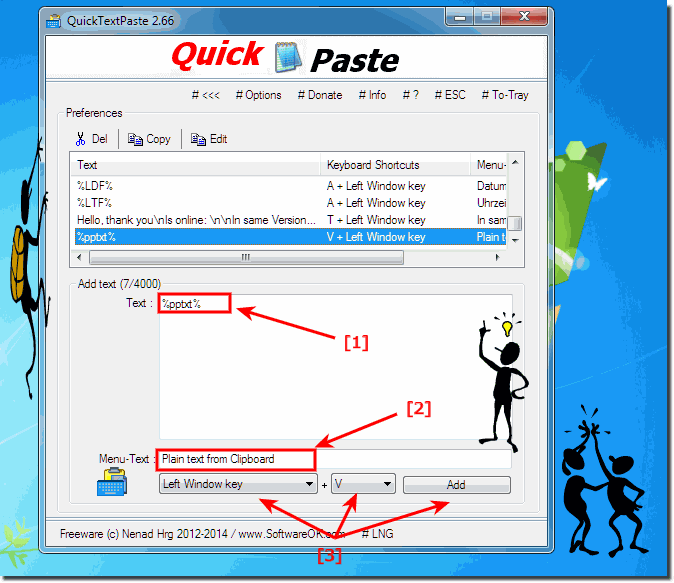 Can i on Windows, 10, 8.1, seven use quicktextpaste to paste plain text from the clipboard plus placeholder is here a solution for this simple and easy problem?